SPIRIT OF THE EAGLE — The year is 1851. In the spectacular wilds of America's Northwest territories, legendary mapmaker Big Eli McDonough (Dan Haggerty – TV's The Life and Times of Grizzly Adams) roams the mountain forests accompanied by his highflying friend and ally, Lady, a majestic golden eagle. There's trouble in this paradise, however, as McDonough's ten-year-old son Little Eli has been kidnapped and sold to the Indians by the ruthless, one-eyed river pirate Hatchett (William Smith – Maverick). After a fierce battle to win back his son, Big Eli, Little Eli, and Lady join forces with a beautiful Indian maiden for a final sensational showdown with Hatchett and his treacherous band of river rogues. 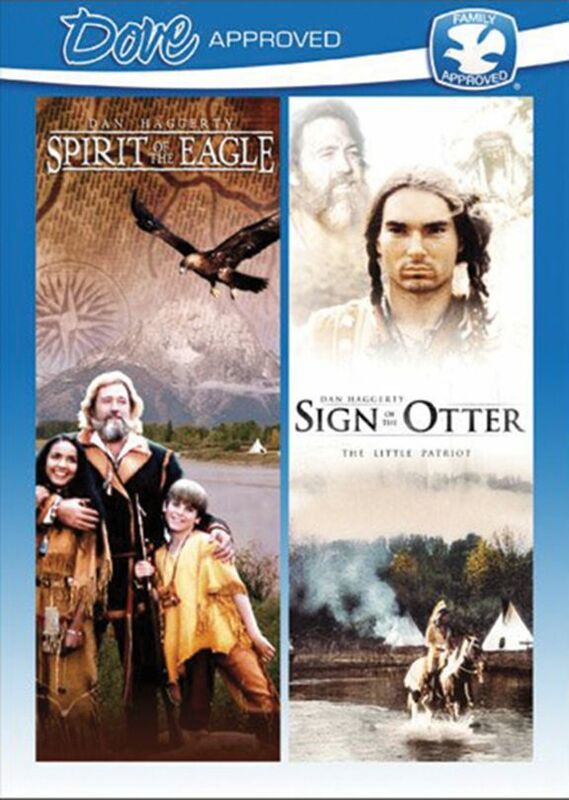 Spirit of the Eagle is a rousing wilderness epic for adventure fans of all ages! SIGN OF THE OTTER — Based on events that stirred the works of James Fenimore Cooper's The Last of the Mohicans, Sign of the Otter recounts one wilderness family's adventures and encounters with the American Indians, the English, and French in a grand, exciting and colorful time: frontier America. Dan Haggerty is the leader of the American rebel forces who teaches Samuel Todd how to survive in a hostile environment. But when Todd's young son is captured by a ruthless British commander, he seeks the help of Native Indian chief, Tekhane. To save the boy in a daring rescue, Todd and Tekhane must scale the walls of historic Fort Niagara with the British in hot pursuit!